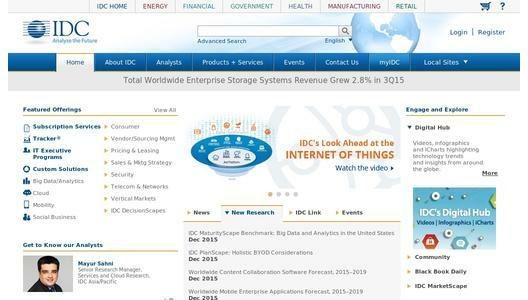 According to the International Data Corporation (IDC ) Worldwide Quarterly Converged Systems Tracker , the worldwide converged systems market increased revenue 6.2% year over year to $2.5 billion during the third quarter of 2015 (3Q15). The market generated 1,261 petabytes of new storage capacity shipments during the quarter, which was up 34.8% compared to the same period a year ago. "The overall market is showing growth but that growth is primarily driven by very rapid growth in the hyperconverged systems market," said Kevin M. Permenter , senior research analyst, Enterprise Servers . "Smaller and more flexible systems, like the ones found in the hyperconverged space, were well positioned to take advantage of the burgeoning mid-market customer segment this quarter." IDC distinguishes between three market segments: Integrated Systems, Certified Reference Systems, and Hyperconverged Systems. • Integrated systems are pre-integrated, vendor-certified systems containing server hardware, disk storage systems, networking equipment, and basic element/systems management software. • Certified reference systems are pre-integrated, vendor-certified systems containing server hardware, disk storage systems, networking equipment, and basic element/systems management software. Certified reference systems, however, are designed with systems from multiple technology vendors. • Hyperconverged systems collapse core storage and compute functionality into a single, highly virtualized solution. A key characteristic of hyperconverged systems that differentiate these solutions from other integrated systems is their ability to provide all compute and storage functions through the same server-based resources. This chart is intended for public use in online news articles and social media. Instructions on how to embed this graphic are available by clicking here . During the third quarter of 2015, the Integrated Systems market generated revenues of $1,591.35 million, which represented a year-over-year decline of -1.41% and 62.3% of the total market value. VCE was the largest supplier of Integrated Systems with $442.82 million in sales, or 27.8% share of the market segment. Certified Reference Systems sales grew 0.31% year over year during the third quarter of 2015, generating more than $680 million worth of sales. This amounted to 26.8% of the total market value. Cisco/NetApp was the top-ranked supplier of Certified Reference Systems in the quarter, generating revenues of $308.96 million and capturing a 45.18% share of the market segment. Hyperconverged sales grew 155.3% year over year during the third quarter of 2015, generating more than $278.8 million worth of sales. This amounted to 10.9% of the total market value. IDC defines converged systems as pre-integrated, vendor-certified systems containing server hardware, disk storage systems, networking equipment, and basic element/systems management software. Systems not sold with all four of these components are not counted within this tracker. Specific to management software, IDC includes embedded or integrated management and control software optimized for the auto discovery, provisioning and pooling of physical and virtual compute, storage and networking resources shipped as part of the core, standard integrated system. Revenue values for all three market segments exclude revenue from support and maintenance contracts. For more information about IDC's Worldwide Quarterly Integrated Infrastructure and Platforms Tracker, please contact Lidice Fernandez at 305-351-3057 or lfernandez@idc.com .